WASHINGTON—Four United States senators are reportedly recovering in Washington-area hospitals today following a shocking and grisly incident Thursday night, when a 480-pound male tiger brutally mauled the elected officials in front of a full audience at the nightly Congressional Exotic Live Tiger Show held in the senate chamber. “At the time of the incident, [Sen.] Dianne [Feinstein (D-CA)] and I were performing a routine flaming ring jump—a trick we’ve done hundreds of times during the show’s nine-year run—when Marduk, one of our white Bengal tigers, swatted her to the ground and then proceeded to clench her in his teeth and toss her around on the podium for several seconds,” said chief congressional tiger-master and two-term Georgia senator Saxby Chambliss, appearing deeply shaken as he explained how the tiger then leapt into the crowd and attacked Sens. Bernie Sanders (I-VT), Carl Levin (D-MI), and Pat Roberts (R-KS), dragging the latter by the neck out to the Capitol rotunda. “I still have no idea what went wrong. Marduk had been completely docile and compliant from the beginning of the show when I commanded him and [Siberian tiger] Georgina to stand up on their hind legs at the start of the Pledge of Allegiance, to when Mitch [McConnell] led him through his choreographed leaps across all 100 senate desks. 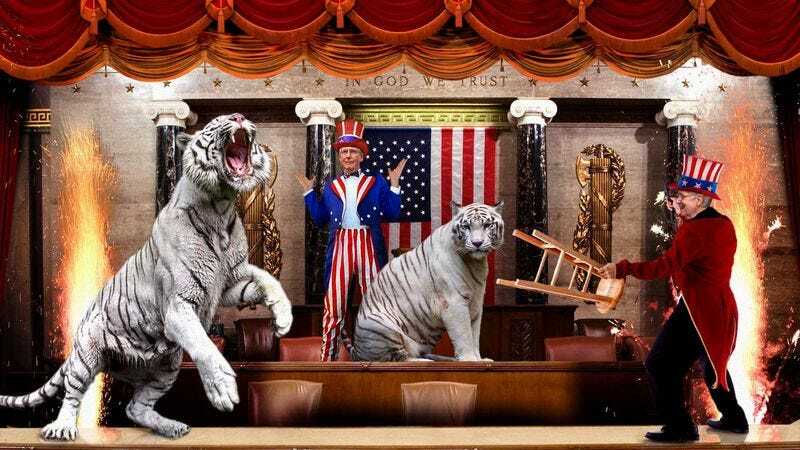 It’s just a terrible tragedy.” In the wake of the incident, all upcoming live tiger shows have been canceled indefinitely, though congressional sources confirmed The Magic Of McCain Illusion Extravaganza would continue its twice-nightly performances as scheduled.